The Firepower .45 Metal Slide Pistol is a heavy weight so it feels weighty and solid in your hands. Featuring a rear sight you will be a sharp shooter in no time, and with fire power of 328 FPS you will hit targets with ease! A 12RD magazine and 50 practice BBs are sure to give you an edge over your opponents. I love this spring pistol... it's crazy accurate even with .12g bb's but moreso with .20g - this thing really packs a punch. If you load the clip and then pop it back out, a few BB's will fall out (but who cares, nobody does that)... so just keep cocking firing until you're empty. Great fun in the backyard! 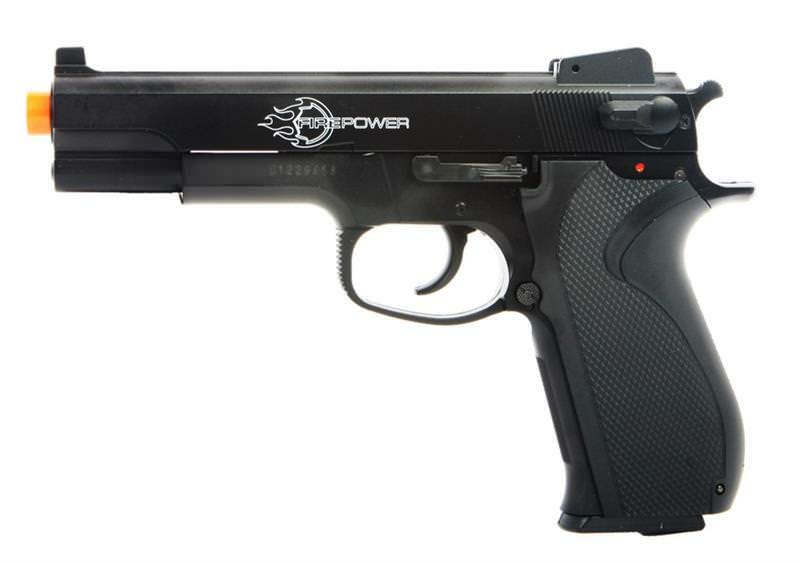 This model is excellent quality, and heavy weight almost like a real firearm. The clip is also slightly spring-ejected which helps with reloading. The top of the clip has a small switch you can hold down and scoop up BB's faster right out of the palm of your hand. If you're looking for a great spring pistol in the 300fps range without CO2 to save on costs, then don't even hesitate; just buy it. You will be glad you did.